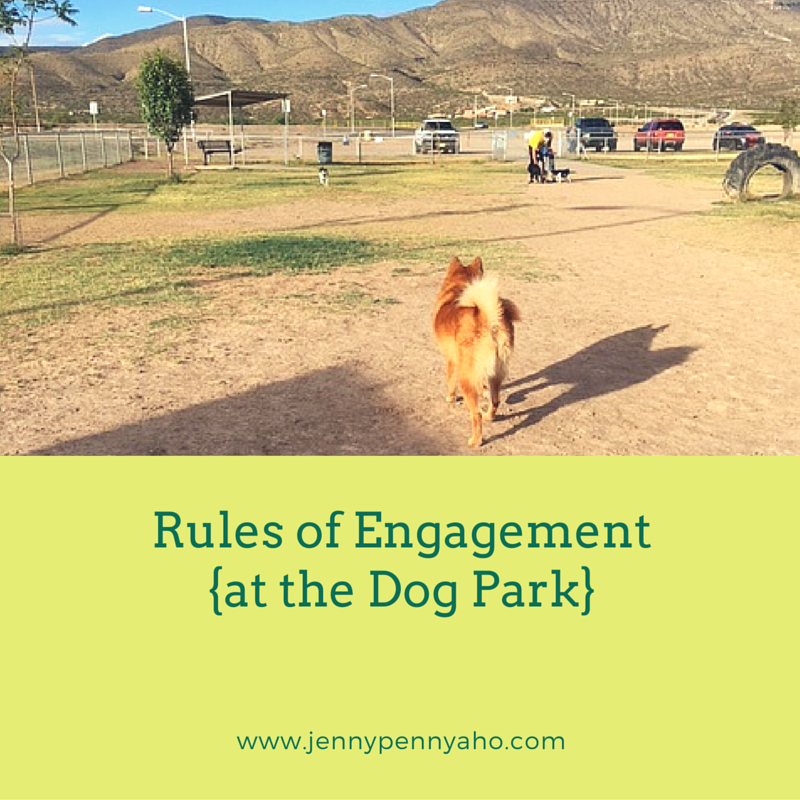 This post is for those who want to take their dog to the dog park, but aren't sure of the "unwritten rules." As many of you know we have a dog named Hugo. He got when he was 3.5 months old. Now, he is just over 3 years old. He is a crazy, lovable, adorable, soft and fluffy dog who loves chasing me in the back yard, chewing on kong toys and bones, going for walks/runs and going to the dog park to sniff and play with other dogs. Many people say "what kind of dog is he? 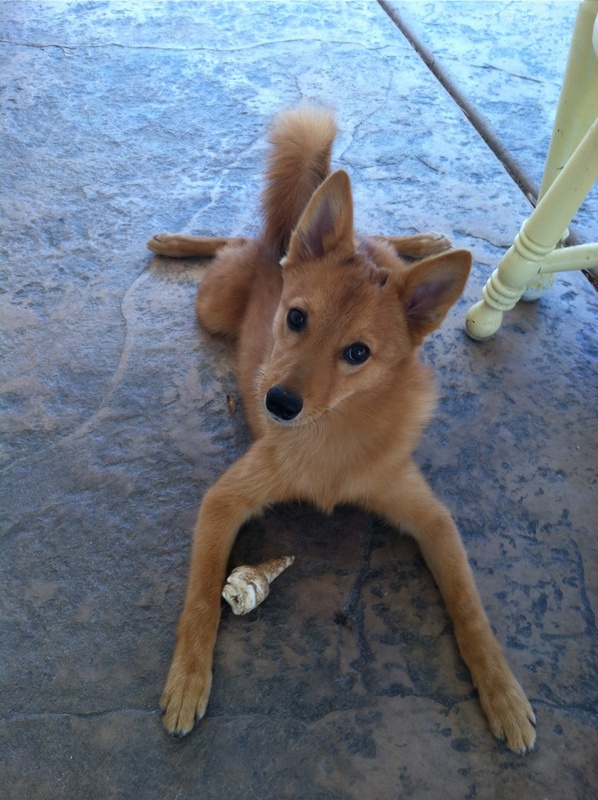 He looks like a fox!" He indeed looks like a fox and we love him to pieces. When he was a puppy we introduced him to the dog park, so he could expend his puppy energy and also to socialize him with other dogs. We have learned what to do and not to do at the dog park from our trainer and also from experience. It is best to get to know your puppy and work with an experienced trainer to get obedience training completed as soon as possible. We took Hugo as soon as he was up-to-date on his vaccines. His obedience training was once per week (1.5-2 hours) for six weeks. I only have experience with Hugo and do not have any experience with rescue dogs, but working with a trainer is never a bad idea. The trainer may be able to help you with some behaviors your dog is exhibiting that you thought you just had to "live with" (i.e. destroying toys, dog beds, growling when a toy is taken away, just to name a few). Hugo doesn't necessarily need to go to the dog park to expend energy anymore, but once a day he will come to us and bark and let us know "com'on it's time to go to the dog park!" We enjoy taking him 3-4 times a week. After all, it keeps makes him happy, tires him out and we get to socialize a bit with other dogs and people. Hugo at 3.5 months old. -do not take your dog to the dog park until ALL of their vaccines are completed. We waited another week or so before taking him just to be sure he was protected. -scope out the park BEFORE you bring your dog for the first time. Look for shaded areas, water fountain, small gated area at entrance/exit, dog bags for clean-up, trash cans. Typically the dog park hours are posted at the gate. -never bring treats -- period! Training and/or rewarding dogs with treats should be done at home, not in a dog park. Leave the treats at home or in your car. If you forget to leave at home, don't get mad if other dogs follow, bark and sniff you -- they have good noses and they will smell it whether it's in a bag or not. -don't play or talk on your phone. This is extremely annoying! Watch your dog. Especially when they end up "taking care of business" and you don't see it happen or where it happened. Last evening, I saw a perfect example of someone glued to their phone and not paying attention to when his dog took care of business. We have one lady who typically speaks up and says: "your dog is pooping!" It gets everyone's attention, that's for sure! -do not keep your dog on a leash while entering or while in the dog park. There is a reason there is a small gated area at the entrance/exit. The small gated area allows you to enter, close the gate and gives you time to remove the leash and introduce your dog to the other dogs through the fence. The dogs can sniff through the fence. This will allow you time to determine if you dog should even enter the park. When exiting, the small gated area will allow you time to put on the leash. Typically, everyone prefers to be in the gated area with their dog only. If you see someone in the gated area, wait 10-12 feet away from it, to allow the owner to leash or unleash their dog and enter or exit the area. -if you have a small dog or puppy and it's getting surrounded by big dogs, stay calm and do NOT pick up the dog. The other dogs are just curious and want to sniff, it's how they say hello. If you pick up the dog, it informs your dog you are scared and then your dog will sense your behavior and will get scared. Dogs can sense your emotions. Stay calm! Freaking out and picking up your dog will cause the other dogs to get even more curious and begin jumping up on you (whether well-trained or not). If your puppy is small, it would be best to introduce when the dog park isn't busy (don't go at dinnertime or when you see it's crowded). Scope it out and go when it's not busy, so your puppy can be introduced to a couple dogs and then gradually progress to being around more dogs. It worked for Hugo and before we knew it he was enjoying the big dog park more than the small dog park because he could stand his own ground. -don't bring a toy unless you are alright with these simple facts: another dog may steal it, dogs may play tug-o-war with it and/or destroy it some way or another. -spay or neuter. If you choose not to, please don't bring your dog or if you do bring them, be responsible and watch them closely. -accept that fact that there are cliques. Some people take the dog park very seriously and will ask you to leave if you bring treats, don't pick up after you dog, don't control/take responsibility of your dog. -do not wear nice clothes or shoes. You will most likely end up getting dirt and slobber on you, or sometimes worse! -if you choose to bring your children. Remember the dog park is not a playground. Screaming, shrieking noises and running around are not actions that should be done around dogs you do not know. You never know how other dogs will react to your children. To keep your children safe, go when it's not busy and inform your children to ask before petting another dog. -Pay attention to your dog and looks for signs that your dog needs to go home. You will learn your dogs cues. When we first arrive, Hugo typically runs around sniffing, taking care of business, running and playing. When he comes over to us and sticks around or lays down near us, we know he is ready to go home. He knows what "go home" means and will walk to the gate if he's ready. Typically 45-60 minutes does the trick for expending energy. -Look for signs that your dog needs water. Hugo's tongue gets bigger and more pronounced when he is overheated. Most dog parks provide water fountains, but not all. Scope out the dog park prior to taking your dog, so you know whether or not you need to bring water with you. Last evening, I was at the dog park and Hugo had a blast as usual. We were about to leave and some woman had obviously never been to the dog park. She started walking towards the fence, where I was currently putting on Hugo's leash. Her dog was obviously excited. He was barking and pulling on the leash (literally yanking her arm in all directions). I noticed she was walking straight towards the gated area and I had to stop her and ask her to wait until we exited. She didn't say a word to me, but she obliged and just stood on the other side of the gate only 2 feet from the exit. Her dog's tail was wagging (good sign), but as soon as Hugo and I exited, the dog immediately started growling and tried to snap at Hugo. I kept walking towards the car and she entered through the gate. Almost immediately all of the dogs in the dog park ran over to greet her dog and all of them were jumping and barking. This immediately got the attention of the owners and they all were walking over to their dogs to move them away from the gate. The only good move she made was that she realized was she was losing control of the situation and her dog was too aggressive to enter the dog park. So, she exited back out of the gated area and went to her car to leave. My recommendation to her would be: She should have scoped out the area and brought her dog when it wasn't busy. There were literally 20 dogs there and she obviously isn't the alpha in the relationship. After this instance, I knew I had to post this even though it may offend people. The truth is, you need to take responsibility for your dog and determine what is best for you and for them.